What you see above is strictly a parody of an Oprah magazine cover. Burnell created it to amuse himself. He loves to do that. But it got me to thinking: gee, if it’s good enough for Oprah, then why not? I mean, I’ve got plenty to say, and I am an internationally known media star, not unlike Oprah. And let’s face it, there are just so many things to write about that interest cats and the people that love them. So, who knows? Perhaps the world is ready for a cat-centric magazine written by and for cats with the world’s greatest feline diva at the helm. Hmmm? First, Nora – that is one splendid cheesecake photograph! 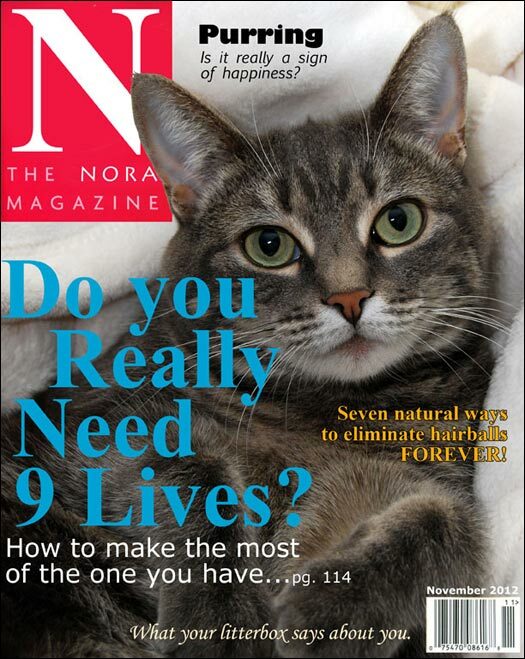 Second, I agree, it is time for a cat magazine written by the feline of the species – sign me up! Nora, I think that is a great idea! I have been thinking of starting my own magazine for years, but I just cannot get my editorial staff (i.e., my human) to get focused on it!! If you did this I would for sure get the magazine because of my daughters cats Leah and Phaedrus. By the way Phaedrus is a male but nearly identical to Nora. I have a cat too! Her name is Cora. She is a lovely cat. She plays the trumpet. She prefers Bach too. She also prefers valerian drug on the mouth peice of the instrument. Hmmm… that reminds me of Iron Chef America, which has a chef named Cat Cora!